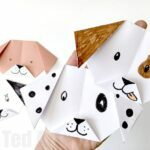 My kids have been asking me how to make paper squishies for aaaaages. I confess, it has taken me about 3 months to get around to doing some. I am not sure why… maybe because I worried they wouldn’t be as “cool” as real squishies? 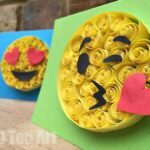 Well.. judging by my son’s (10yrs) delight, these DIY Paper Squishies are plenty cool! 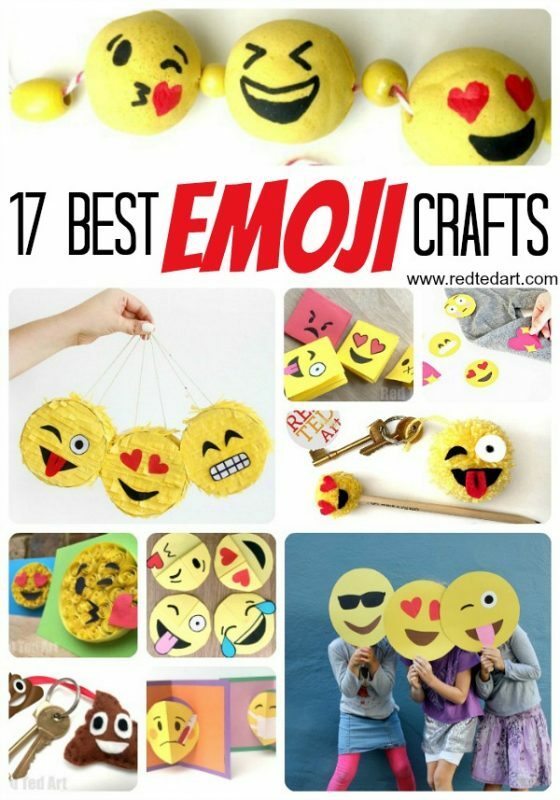 And of course DIY Emoji Crafts are the best. Yes, they are not as perfect as the shop bought ones, but they are easy to make and surprisingly satisfying to squish and play with. What’s more.. you can experiment with “slow rising” and “quick rising”, by using different things to stuff your paper squishies with, as well as experiment with pricking little holes into your paper squishies. You can also experiment with different shapes and sizes. 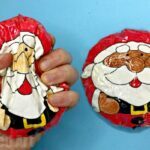 But a general hit: the bigger your diy paper squishy, the better it will will squish and rise again. Also, don’t over stuff them.. and always have a little space for air to escape. Oh how we love a good Paper Craft! Last year it was DIY Fidget Spinners all Summer.. 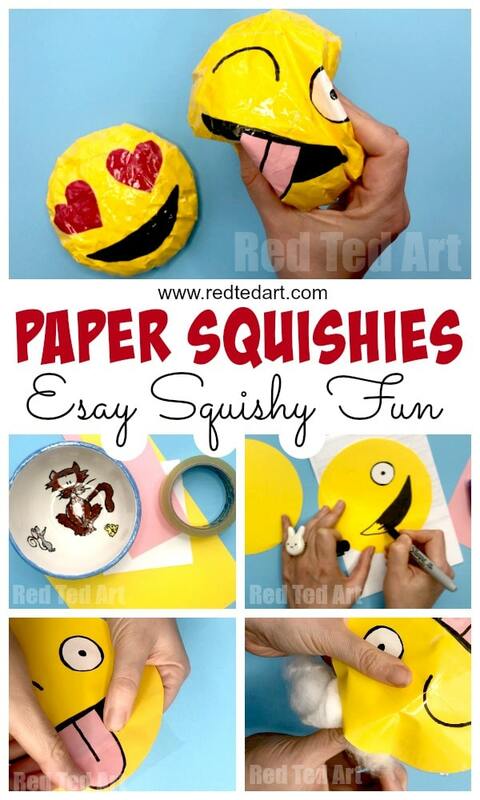 I think THIS year, these easy Paper Squishies, will be the summer camp activity for kids! 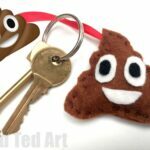 I hasten to add, tha these Paper Squishy DIY is not my invention (I wish it was).. I have been hunting all over YouTube, to see “who made them first” and it has been impossible to find the source. I suspect it was some clever 9yrs old sitting in their bedroom, who first came up with these. Kudos to you! a medium bowl for tracing. 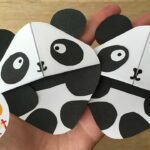 Some of you will be coming from our Panda Egg Paper Squishy video – you can download the Panda Egg Paper Squishy Template here! Watch our easy to follow paper squishies video instructions or the how to make a Squishy step by step instructions below! 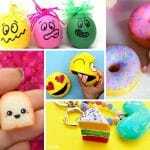 These are the best DIY Squishies that do not use memory foam or paint! 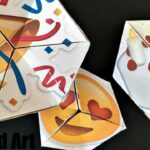 Paper Squishies are really easy and fun to make. From experience, we find the bigger the squishy the better! We used an A4 sheet of paper, folded it in half and made the emoji as BIG as possible to fit on that page. 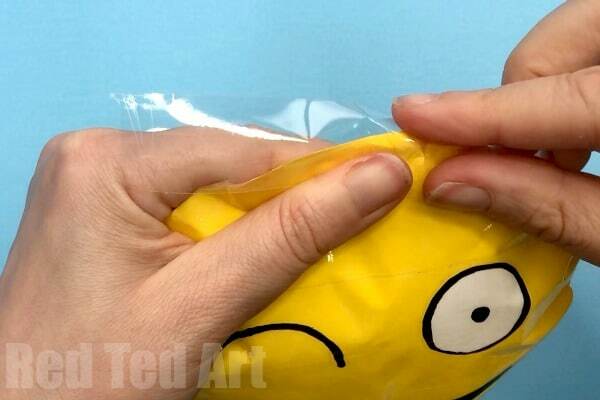 Trace out your emoji squishy by using the bowl. 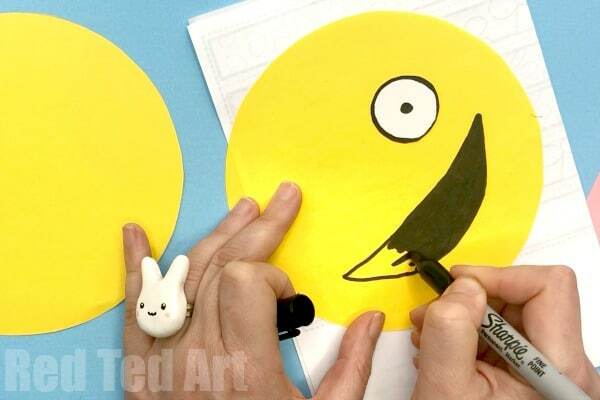 Next, cut out two circles. 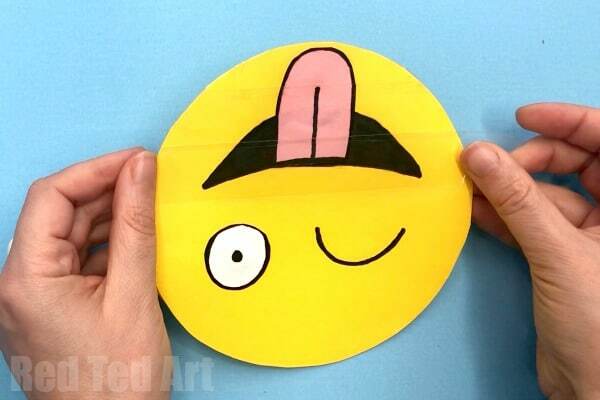 Draw on your emoji’s mouth (you may want to sketch it out in pencil first). It is now time to glue on the paper emoji squishies details. 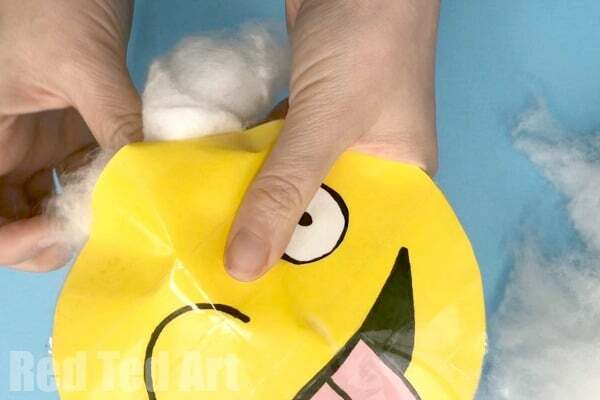 Once your basic emoji squshie’s parts are done, you are ready to tape it all together! Align your two squshy’s sides. And start covering the WHOLE paper with tape – and taping it over the edges. Cover the whole emoji – leaving a gap at he top. 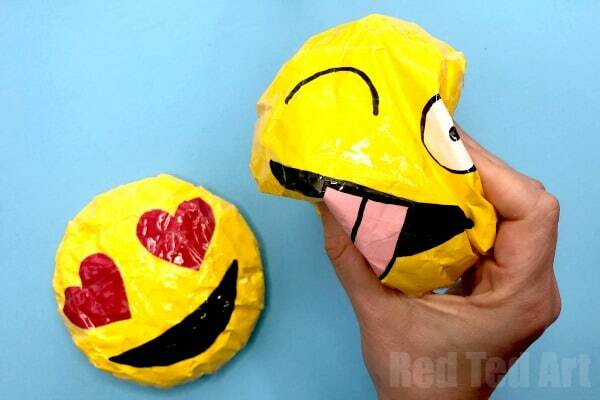 Time to fill your DIY Paper Squishy. We used an old pillow stuffing. But toy stuffing works too .. and it also works with shredded plastic bags. Fill – but not TOO tightly.. else it won’t squish as much. Tape up the top of your emoji. FINISHED!! You can start squishing. You will notice that the “slow rising” effect comes from little air gaps here and there. If your taping skills are superior and there are NO gaps anywhere, you can make some pin pricks to encourage the escaping and refilling of your slow rising paper squishy’s air!!! And lots more Paper Crafts too! 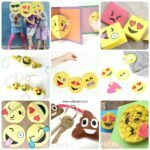 This is a great idea for the kids to try crafts.